I don’t have my own waffle maker (yet), but my parents have been making waffles for post-swimming Sunday brunch ever since I can remember. Being home with them for the summer means I get to enjoy waffles regularly. 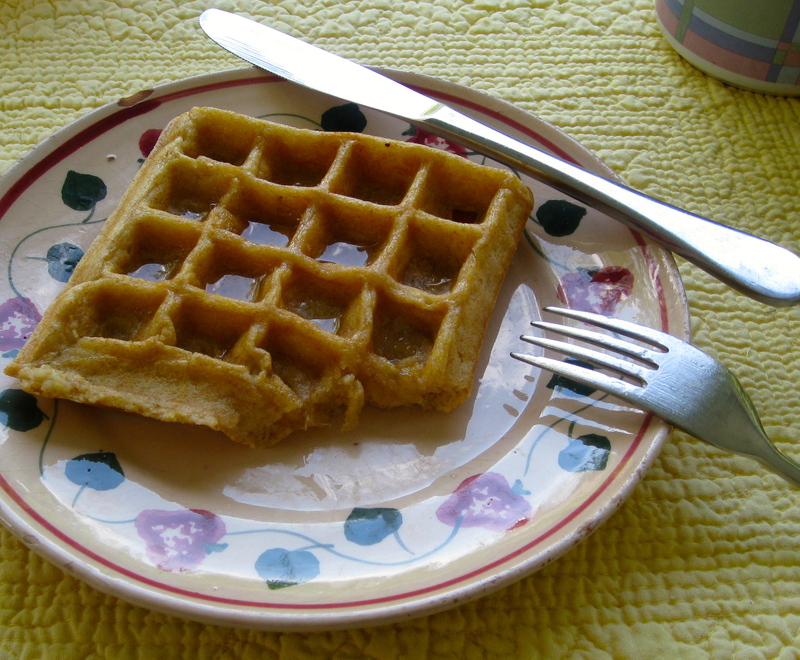 The original recipe comes from the red-and-white-checkered Better Homes and Gardens New Cookbook‘s “Everyday Waffles”; my dad has adapted and perfected his own version by subbing in whole wheat flour and adding cornmeal. The combination of white and wheat flours with cornmeal gives these waffles a lovely, grainy-but-not-gritty texture. We also had ripe bananas this week so, like I do with my pancakes, we mashed one into the batter, which kept the waffles nice and moist. Feel free to leave the banana out if you prefer unadulterated (“unafruiterated”?) waffles. There are no spices in these except for vanilla, though I imagine they’d be delicious with a sprinkling of cinnamon and maybe some nutmeg. Feel free to get creative! Whisk together the dry ingredients. In a separate bowl or large measuring cup, whisk together the egg yolks, banana (if using), vanilla, buttermilk, and oil. Stir the wet ingredients into the dry. In a small bowl, beat the egg whites until stiff peaks form. Fold the whites into the rest of the batter. Bake the waffles on your waffle iron for the time instructed. Eat hot with butter, maple syrup, yogurt, fruit, and/or molasses. This entry was posted in exercise, family, food, health, pictures, recipes and tagged breakfast, brunch on 11.07.2013 by taplatt. Um…yum! Def better than what I just ate! Hope you get a chance to make them! Thanks – they certainly are! They aren’t too hard, though waffles do take multiple bowls to prepare, since you have to whip the egg whites. Totally worth it, though. If you’re a pancake fan, my pancake recipes might be a good place to start if you don’t have a waffle iron. Happy cooking!